The drop-in center was very busy on Sunday, June 24, 2018, as it was the last day until opening again on August 5, 2018. Photo names from left to right: Emily Rosario, Susan McHugh, Jim Snodgrass, Kristy Bernzott, Qua Redditt. The Performance Team staff (with Jim and Frank leading them) were a big help to Chef Melody in preparing the day’s meals, including large sheets of marble cake. 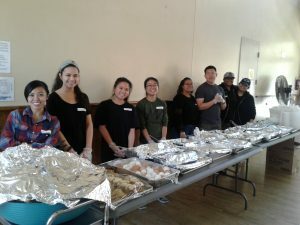 In addition to several regular volunteers, we had new students from CSULB summer courses and the LBCC Men of Aztlan club. 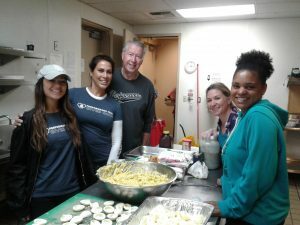 The drop-in center hosted 222 guests, including 22 new guests this day, with the help of 40 volunteers. Long-time volunteer Steve Leary donated a dozen bags of clothing from La Bomba vintage clothing store. Thank you to all UCO supporters including Terry Mercer who contributed clothing this past weekend. All of the men’s clothes and nearly all of the women’s clothes were taken by UCO’s clients. UCO counselors did intake of 5 new clients and provided assistance to several other clients with permanent housing searches. Days prior, UCO staff placed client and her young daughter at Flossie Lewis Recovery Center. Transportation assistance was provided to clients who needed money for bus fares to medical appointments. UCO staff conducted successful fund-raising campaign to assist permanently-housed client in purchasing a used car to replace her stolen, wrecked car. This client now feels hope that there are people who care enough about her to invest in her future. While she was homeless with her young son, she had been repeatedly denied assistance, even though she always worked and acted responsibly.